Upside Innovations is a lead manufacturer of ADA ramps for commercial and industrial applications. The video shows the ADA ramp guidelines we follow when we design each ramp system. Ramp handrails should extend straight and horizontally above the landing for at least 12″ beyond both the top and bottom ramp runs. If the ramp does not continue after the landing, the extensions should return to a wall, guard, or the landing surface. If it does continue, the handrail should be continuous. 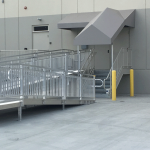 The minimum clearance between the handrails is 36″ as deemed by the ADA, but our ramps are designed to allow for easier two-way traffic with a 48″ clearance. 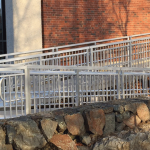 The guardrail, which is different than the handrail, must be at least 42″ from the walking surface to prevent people from falling over the side of the ramp. The guardrail can be distinguished from the handrail by the square tubing that is not completely continuous along the length of the ramp. The maximum space allowed between the vertical balusters is 4″ so that children cannot slip through and fall off of the ramp. Hidden welds aren’t required by the ADA, but we design our products to hide the welds so that the product has a clean appearance. Our standard ramp material is extruded mill finish, but other options include Rhino Lining (protective spray coating) and various color options via powder coating. Handrail gripping surfaces and any surfaces adjacent to them should be free of sharp or abrasive elements and should have rounded edges. Our splice connections are smooth, so people can run their hands along the entirety of the ramp without getting cut. ADA requires that the maximum slope of a ramp is 1:12 which means for every inch of platform threshold height, you need an additional 12″ of ramp length. For more information about ADA ramp guidelines, check out our ADA Handrail Checklist and Printable ADA Ramp Checklist.